Easter is the time par excellence for baptism, especially of adults. All over the world, new Christians were born into the family of the Church at the Easter Vigil. Since then, during the Octave of Easter, they have been rejoicing, basking in the glow of that celebration. 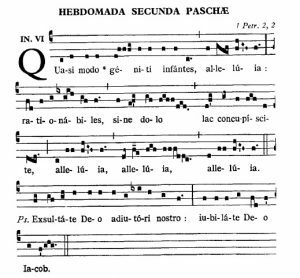 Today concludes the Octave, and the new Christians are addressed in the entrance antiphon of the Mass, in words taken from the first letter of St Peter. That letter was written to newly baptised Christians in the early church, to encourage and exhort them, especially in a time of trial. The antiphon speaks with the voice of St Peter, the voice of a teacher, a wise elder, and also the voice of the Church as mother. It tells the new Christians that their journey has not ended, it has only just begun. They are like newborn infants, newly born into life in Christ. But they must not remain infants, no matter how delightful infancy is; they must grow and mature. And no infant grows up without being fed. What does a newborn infant want? Milk, and lots of it. The new Christians – and all of us too, for we all renewed our baptismal commitment at Easter – are to long for pure, spiritual milk. What is that spiritual milk? There are at least three possible answers. First, the spiritual milk is Christ himself. This is suggested by the translation used here: that in him you may grow to salvation. Longing for this pure, spiritual milk which is Christ himself will lead to prayer and lectio divina, to communication and communion with Christ. True desire for him will prompt us to purify our hearts, to make ever more space for him in our lives, to take all the steps that will permit union with him, contemplation of him, awareness and mindfulness of him. Second, the spiritual milk may be understood as the Eucharist. The next line in the letter of St Peter quotes psalm 33, so the full phrase is ‘you must long for the pure, spiritual milk… if you have tasted and seen that the Lord is good.’ This taste and see that the Lord is good was understood by the early Christians as a reference to the Eucharist. And psalm 80, with which this antiphon is sung, concludes with God’s promise to feed us with finest wheat and fill us with honey from the rock, another reference to the Eucharist in the understanding of the early Church. The newly-baptised celebrated the Eucharist fully and received holy communion for the first time at the Easter Vigil. Now they are exhorted to continue to long for that food and milk for their souls, and to approach the Lord’s table with longing, for it provides a special nourishment for us all so that we may grow to salvation. A third understanding of spiritual milk is “teaching” or “instruction”; learning more about faith in Christ and what it means. The image of spiritual milk is used in the sense in other places in the New Testament: “Still infants in Christ, I fed you with milk, not solid food, for you were not yet able to take it,” St Paul says to the Corinthians (1 Cor 3:2), and the writer of the letter to the Hebrews chastises his readers: “You have gone back to needing milk, not solid food” (Heb 5:12). So milk is basic, elementary teaching; and solid food is more advanced spiritual doctrine. For the newly baptised, it is entirely appropriate to speak of being nourished with milk, basic teaching. The period of instruction in preparation for baptism, particularly during Lent, is followed by more teaching (traditionally called mystagogical catechesis or ‘instruction about the mysteries’) between Easter and Pentecost, which spells out further for them the meaning and consequences of the sacraments which they have received. What about more mature Christians, those of us who are not newly baptised? For us too this can be a time of learning ever more about our faith. In Eastertide, the Church particularly puts before us teaching about the Eucharist, and about life in Christ, especially in the Sunday Gospels and in the readings from the Fathers of the Church in the Office of Readings (monastic Vigils). We never grow beyond entering more deeply into the meaning of these texts. How will you respond to the invitation to long for spiritual milk this Eastertide?